Today, I was able to substitute teach at the preschool where I worked for several years during college. I was teaching in the 4 year old room and was reminded about the importance of play. I had a fellow parent tell me this week that they preferred for their children to have a more structured schedule rather than simply playing. To me, I think it is possible, and even necessary, to incorporate both into a child's routine. We all learn differently. Some of us are visual learners, some auditory, and some kinetic (learning by doing). For a young child, what can you do to incorporate ALL of these learning styles? Play! The morning routine for the 4 year olds I was with today was "free play" until everyone arrives. Today, the kids were using huge wooden blocks to create a pirate ship. One of the reasons that I absolutely love this age is that they still want the teacher to be involved in their activities. "Mrs. Marcie, come on the pirate ship with us. This is the super long plank, and this is the hole where we drop food for the sharks." This simple comment lead us to discussions about what sharks eat, what kind of sharks we had heard of before, where did the sharks live, what else lives in the ocean, what do pirates wear (one little boy was convinced that pirates wear belts), and so many other questions. Kids are WAY smarter than most adults give them credit for. At the bottom of the photo, you can see the plank. This is the part of the "game" where they decided that the pirates needed a nap, haha. This was the bunk on the pirate ship. Now, everyone can imagine up ways to play with 4 year olds... They help you because they are so creative. But what about an 8 month old? Oh the ways! When Isabel had her meeting with ECI about her slow development in sitting (she has completely caught up, by the way), they told me to make everything a game. They had me sit behind her and hold her hands while she was sitting and show her how to use her hands to brace herself if she started falling. All kids find that falling sensation funny, at least when they know mommy is right there to catch them (think about daddy throwing baby up in the air, bouncing on the bed, the knee/horsey game)! She loved doing this, and within days she was sitting on her own. Now we use play to help her learn all sorts of things. Stacking cups help her learn colors, sizes, in and out, cause and effect when she knocks them over, etc. Bath time teaches her sink and float, wet and dry, etc. And if you feel comfortable incorporating technology into your play, the possibilities are endless. 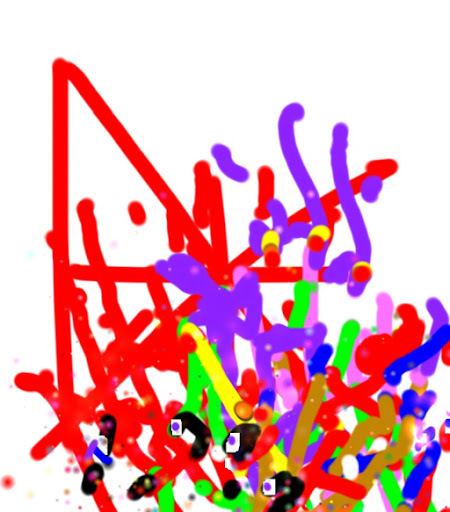 This is a "painting" Isabel created using an app on my iPad called Paint Sparkles. As with most things at her age, the main thing she can learn using this app is cause and effect. When she touches the screen, colors appear and she hears music. She also gets to touch, feel, see, experience - not to mention see the pretty colors. I'm not saying this is easy - there are so many times that I am exhausted and I would much rather just lay on the couch and watch tv, but play is energizing and mood enhancing - mutually beneficial for mommy and baby.